Welcome to part four of my seven part series on healthy communication. If you are just tuning in I have already covered covered using “I” statements and waiting periods, and the importance of eye contact. There is no need to read the posts in order so you are welcome to jump around however you like! This week is all about setting boundaries and sticking to them. Everyone needs healthy boundaries because they let people know what is and isn’t ok in a relationship. Whether you are training a dog, raising kids, or becoming intimate with someone you need to know where the line is and communicate about it. Setting boundaries for many people is easier said than done. For those of us who are people pleasers it can be hard to draw a line and hold to it when someone repeatedly tests it. But, it is important in any relationship to communicate about where the line is for you. If someone doesn’t know what is unacceptable to you they will never be able to stop doing it. When setting a boundary be clear that is what you are doing. You can even say to the person “this is a firm boundary I am setting”. Whatever the line is, make sure that you can state it to the other person as an observable behavior. For example, if you say “my boundary is that you can’t be mean to me.” The person might not know what that means. Instead, you might tell them “I am setting a firm boundary that it is unacceptable for you to call me a b**ch”. Remember, boundaries are not ultimatums and they are not walls. Unlike ultimatums they are not intended to manipulate another person. Instead, you are setting them in order to have a healthy, communicative, and caring relationships. Similarly, they are not walls. You are not throwing up a defense but rather asking for something important so that you can grow closer to the other person. One of the key differences here is intention. You might ask yourself, what is my intention with this boundary? Take a moment to sit down and think about a boundary that you need to set. If you don’t know where to start, you might allow yourself to think of a relationship in which you have been resentful lately. When you think about this resentment, begin to identify where it is coming from. Is there a need that you have that is not being met? Allow yourself to take a few moments to think about what your need is. Or, is something happening that is unacceptable to you. If so, take a moment to reflect on what that behavior or dynamic is. Start to put into words what your need is. Rather than going into any narrative or story about the problem, just create one sentence that sums up your need. Label the particular behavior the other person is doing or is not doing. If you were to ask another person to meet this need, what would you say to them? If it is helpful you might use this phrasing as a template: “I am setting a boundary that it is unacceptable for _______” or “I am setting a boundary that in this relationship I need _______” (insert behavior from step four into the blank). Now that you know what the boundary is, dedicate a few moments to think about how you can stick to it. What will happen if the other person does not respect it, agree with it, or want to meet it? Note: only set boundaries if you are truly willing to stick to them! 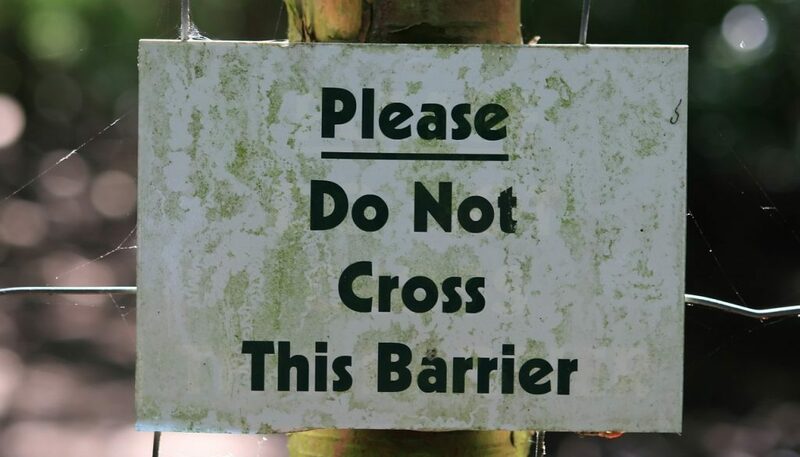 When we set boundaries and then don’t follow through, we teach people that it is alright do disregard our boundaries. If you are not fully ready to set it and see it through, wait until you are. Also, you might want to explain to the other person why you are setting this boundary. You can use “I” statements to tell them how it feels when the boundary is crossed. Even when boundaries seem harsh, you can explain that your intentions with this boundary are to bring you closer together.